Those of you who have been around a while know that I do NOT consider myself a Pinterest-inspired Supermom. 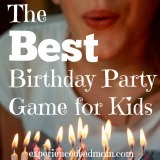 So I’m surprising even myself with today’s post recapping Sydney’s 6th birthday party. I consider this post a service to the other parents out there who may be faced with planning a party around a ROCK. Yes, you read that correctly. A ROCK. Originally, Sydney wanted a princess theme. As I hovered over the “Confirm” button on my Oriental Trading order of wands and tiaras, I asked Sydney if she was SURE she wanted a princess theme. Actually, she wanted a ROCK theme. And ROCK as in geological formation, not Rock ‘n Roll. As you’ll know, her prior birthday party, we used an indianapolis magician who came and delivered an amazing service. Her last birthday was more centred around being traditional – as in a magician, bouncy castle, lots of buffet food and singing/dancing – so we thought this one should be different. Once I stopped hyperventilating, I turned to a party planner’s best friend: Google. 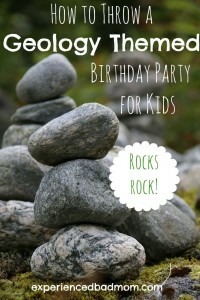 I learned to search for “geology party” rather than “rock party”. This saves you from getting 82,614 Rock ‘n Roll birthday party results. I also told friends and co-workers about the theme. Turns out someone in my office had a large collection of rocks that she donated to our party. And just about any party game for kindergartners can be spun to focus on or include rocks. The 10 kindergartners arrived and could get balloon animals, corsages, and swords made by the high schooler I hired for $25. Do animal balloons have anything to do with rocks? No, but the kids loved it! 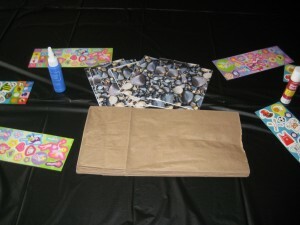 Next, the kids decorated brown lunch sacks with stickers and pictures of rocks that I had printed. They needed those bags for our next activity, rock hunting. I wrote each child’s name on a rock and hid it in the basement (it was too cold and wet to go outside). To stretch the excitement out a bit, I made them go down 2 at a time. I dimmed some lights and provided 2 head lamps if they wanted to wear them for the hunt (most didn’t). After everyone found their rock, it was time to paint them using tempura paints. Most kids liked this so much they asked for more rocks to paint. Then it was time for two games. I passed around a jar filled with rocks and each child guessed how many were in it. The person with the closest guess won a small prize. Then it was time for cake and juice. I used chocolate frosting to make our rock cake dirty (!) 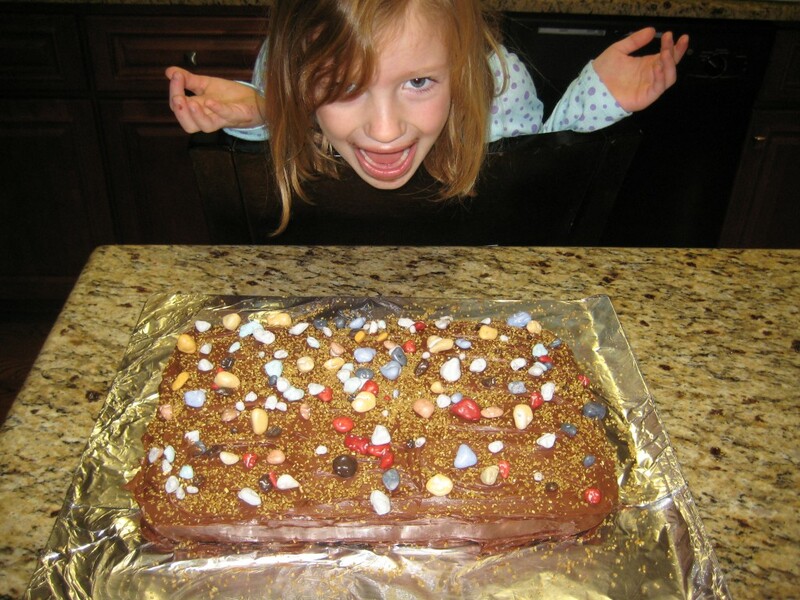 and decorated with chocolate rocks that tasted really good. Our final activity was arguably our easiest and most well-received. The kids sat in a circle and played hot potato, passing around a potato until the music stopped. When it did, whoever was holding the potato got to give Sydney his or her gift to open. Every child, including the very last one, was so excited when it was his or her turn to give Sydney her gift. And this eliminated the classic push and shove mob found at most kindergartner’s birthday parties when it’s time to open gifts. 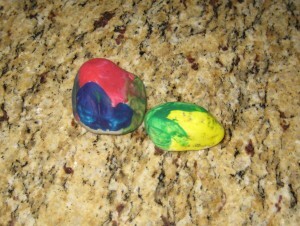 The kids took home their painted rocks, bouncy rocks, Pop Rocks, and assorted candy as party favors from the successful geology-themed birthday party. As the last kindergartner left with a smile on her face and a bag full of rocks, I felt like Clark Griswold in Christmas Vacation in the closing scene: “I did it,” he says. I know how you’re feeling, Clark! Good luck with your next birthday party. May it rock! Now, I have Party Rock Anthem in my head. That sounds like an incredible party. And I admire that she picked her own theme, instead of doing what everyone else might have done. The rock theme frightened me at first, but turned out to be a lot of fun! I like that hot potato game at the end! What a great way to take turns for giving the gifts!! I’ve got another year or two before I have another kid-party to host. We usually just invite the adults/relatives. That game took 30 minutes and everyone loved it. Just saw it suggested on a Facebook post once on another mommy blog, so can’t take credit. But I recommend! This is awesome!! I absolutely love that she changed her mind away from the pricness theme. You did an awesome job with the rock theme! Thank you! Rocks turned out to be fun, and now I’m being followed by a geology company in Australia on my Twitter account. Bonus! Now a rock party is a FIRST! I would have never tought to search “geology party” though! Good thinking! 😉 You had some great ideas that went with the theme! Especially the rock hunting. Stopping in from SITS! Thanks for coming by and commenting!! What an original party idea Katy. Sounds like a good time was had by all, including you. Oh I just LOVE that she wanted a ROCK theme!!! SO. COOL. And look at how you orchestrated this shindig~ FREAKING AWESOME!!! O my goodness, you are too creative and cute! You made such a unique party that I’m sure those kindergartners will be talking about it for ages. Happy Sharefest! Ariel AND Thomas birthday cake one year. Have a great weekend. That is so cool – both that she wanted a rock party and your interpretation of it. It sounds like a lot of fun. Love that you had a rock hunt in the basement with headlamps! I think the party was a hit! She went from princess theme to rocks which is pretty awesome. I liked that they went “mining” for their rock. What a cute idea! Im stoping by from SITS & I hope you guys have a great Saturday! I’m so impressed that you built a party – and an awesome one – around rocks!